From the Adornment series, Vanessa by Amanda Lopez and Tanya Melendez. In conversation with Latinx, LA-based, celebrity portraitist and fine art photographer Amanda Lopez. Lopez emphasizes and examines the power and regality women of color hold, because of obvious massive underrepresentation we receive in media and society. Her various series' Adornment, We are Nasty Women (an inclusive campaign), and her latest, Virgin Mary, reflect that. Lopez's work has been published in Vice, Rolling Stone, LA Weekly, The Washington Post, and was recently featured in MoMA's Items: Is Fashion Modern?. Gallery Gurls: With so much rampant cultural appropriation in fashion from black and brown street culture, your series Adornment is really crucial. What did you want to say with this series? Amanda Lopez: The media in this country bombards us constantly with images of what it means to be beautiful. I personally could never relate to those ideas. The Adornment series, which was created in collaboration with multidisciplinary artist Tanya Melendez, gave us the freedom to redefine the traditional standards of beauty. Our goal was to create a space that honors the brilliance and strength of women of color. We wanted to show the regality of the women in the photos through both traditional and modern adornment techniques. Our intention was for women of color – no matter their age or background – to see themselves reflected in the work and find the confidence to be unapologetically themselves. "Intersectional feminism should be the definition of the word feminism. The bottom line is that ALL women deserve the right to be treated with respect and dignity." Iliona Blanc from the We are Nasty Women campaign. Courtesy of the artist. Your passion for shooting women, especially for WOC really shines through. Can you talk more about you involvement in We are Nasty Women L.A. project? 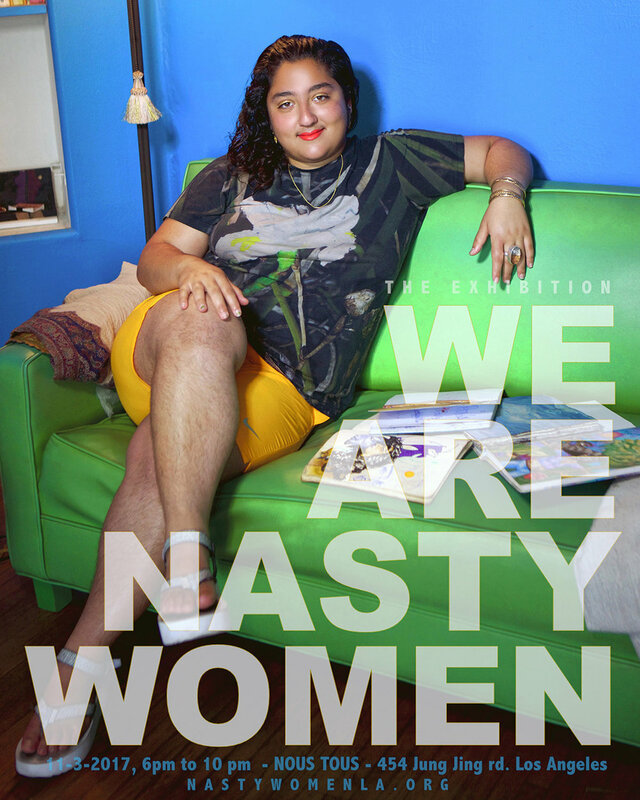 Nasty Women L.A. was founded by the artists Anais Godard and Amanda Maciel Antunes after the presidential election as a way to stand up for women and social justice issues. They reached out to me to help co-create a limited edition calendar and exhibition that highlights women in the arts. All proceeds from the project were donated to Planned Parenthood. I was grateful for the opportunity to collaborate with them and bring attention to the fact that women, especially women of color, are grossly under represented in the art world. I was so inspired by all of the women I photographed. Their passion for their unique craft fueled my own desire to help create opportunities for marginalized voices. Our Lady of Los Angeles, from the Virgin Mary series. Courtesy of the artist. You're exploring contemporary womanhood in your new Virgin Mary series, can you tell me more? Last summer I created a portrait for a show produced by Galchemism, an organization which seeks better inclusion and intersectionality in the art and tech worlds. The exhibition was titled The Politics of Womanhood, so I started to think about the ways that my Catholic upbringing defined what it meant for me to be a woman. I grew up attending Our Lady of Guadalupe church every Sunday. Images of the Virgin Mary were everywhere in my home and also in the homes of everyone I knew. My grandma also wore a huge gold Lupe medallion around her neck (that btw would've made Flava Flav jealous). When I recalled these memories, I realized the vital role the Virgen de Guadalupe played in shaping my adolescent view of womanhood. As I grew up, my definition of womanhood evolved so I wanted to create a series of portraits that examined the iconography of the Catholic Madonna with my own modern Latina views of what it means to be feminine. "The media in this country bombards us constantly with images of what it means to be beautiful. I personally could never relate to those ideas." Kali Uchis. Courtesy of the artist. Kehlani. Courtesy of the artist. In your own words why are you a Nasty Woman? I am a Nasty Woman because I am so over the status quo and want to use my voice and art to help change the patriarchal society we live in. Why is intersectional feminism important and what does it mean for you? Intersectional feminism should be the definition of the word feminism. The bottom line is that ALL women deserve the right to be treated with respect and dignity. What is next for you in 2018? This year I’m collaborating with the founders of Nasty Women L.A. to create a coffeetable book that tells the stories of women in the arts and I’ll be continuing to develop my Virgen de Guadalupe series. Stay tuned! Vashtie Kola. Courtesy of the artist. Paradise from the We are Nasty Women campaign. Courtesy of the artist.